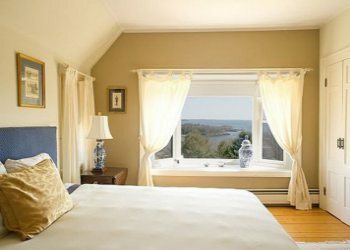 Norumbega Castle is an iconic landmark in the heart of beautiful Mid-Coast Maine, Upscale yet comfortable, Camden�s premier Bed & Breakfast has been brought back to life by its new owners, Sue Walser & Phil Crispo. In addition to the historic and unique architecture of The Norumbega with its breathtaking views of the Penobscot Bay, today's Norumbega Inn provides creative and fresh cuisine and owners passionate about making your experience the best it can be. And your destination of choice. The grandeur of this property will captivate and fascinate you! Overlooking the coast of Penobscot Bay, Norumbega enjoys a spectacular panoramic view of the bay, the ocean, and islands of Camden Harbor. The twelve guest room ( 9 rooms plus 3 suites) 19th Century stone and wood castle exudes a charm and elegance of a bygone era. 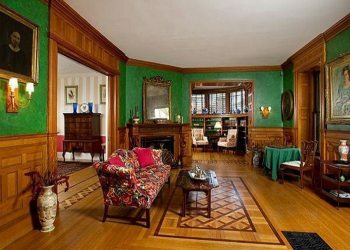 Touches of old-world artistry, throughout the house, feature rich wood paneling, coffered ceilings, stained glass windows, carved gothic fireplaces, balconies and turrets. The public rooms include a grand dining room, music room, parlor, library and the enchanting �courting� alcove. The Norumbega Inn is a distinguished landmark that sits atop a rise overlooking the Penobscot Bay in the picturesque coastal town of Camden, Maine. 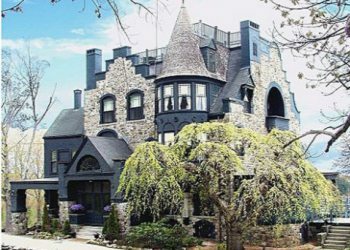 This �stone castle by the sea� was built in 1886, and is unique in design and structure from all other properties along the Maine coastline; it is on the National Historic Registry. Joseph Stearns, who built this mansion, visited many castles in Europe and took his favorite features of each and incorporated them into the design for The Norumbega. It is known to those who have seen it as simply, �The Castle.� After serving as a private residence for nearly 100 years, The Norumbega was converted to a B&B in 1984. Sue and Phil take our mission, simple things done exceptionally well, to heart. Delighting their guests and exceeding their expectations are the hallmarks of our personal style. Owners Sue and Phil are partners in this venture and in life. Phil is a classically trained chef who loves to use his creative finesse in the kitchen. Prior to moving to Maine, he was a chef instructor at the Culinary Institute of America and succeeded in scoring a �win� on the Food Network�s �Chopped�. (His credentials prior to that are noteworthy, as well.) Sue, well�. She is a business exec who screwed up making mashed potatoes in a �Boot Camp� class she took at the CIA a while back. Phil fixed her mashed potatoes and love ensued.